Vehicle Recovery Hebbville | About | McCarthy’s Towing & Recovery Ltd.
McCarthy’s Towing & Recovery Ltd. has been in business for over 35 years. We’re a family owned business, offering personalized and friendly towing and automotive repair services in Hebbville and areas from Shelburne to Hubbards. All of our drivers and mechanics are well trained and fully certified. We know that when you’re dealing with a broken down vehicle you have a lot to be stressed about. That’s why our staff is courteous and polite, working closely with you to get your vehicle back up and running in no time. You can depend on us from the minute you place your call to when your repaired vehicle is delivered back to you. 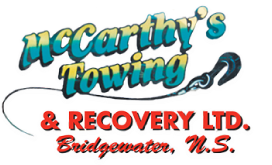 Contact McCarthy’s Towing & Recovery Ltd. in Hebbville for towing and vehicle recovery services. We’re available 24 hours a day, 7 days a week.